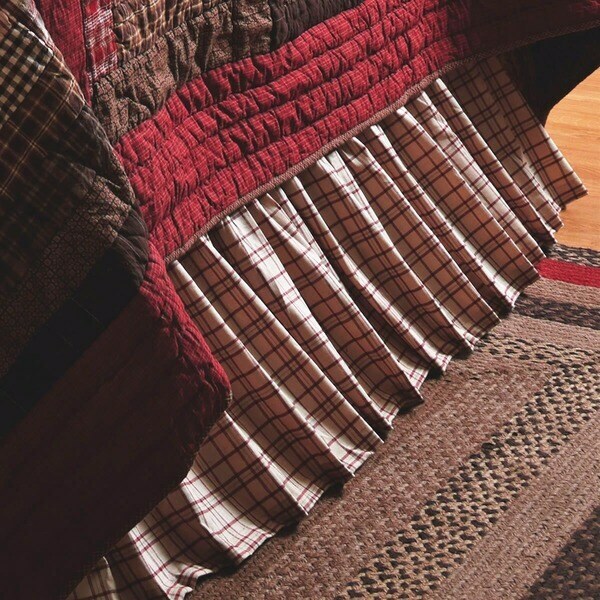 Love this bed skirt and it adds a break in color against the brown/red quilt. You don't see any white around the edges like a lot of bed skirts. Really happy with this purchase. I did not like the color which seemed really faded and unlike what is shown on the website which seemed to be brilliant colors. I was very disappointed in the set because i really looked forward to getting it. These beautifully match our new Tacoma king quilt. Recently renovated our master bedroom and am very pleased with the quality of shams. So excited to see it put together. I purchased the complete set for a log bed in our log home and it is perfect for the guest room. The matching curtains finished the room completely. Just received today. I have to iron it. It looks okay, but I will know more later. Completes the set beautifully. I'm glad I made the purchase. Quality of item & color; however, I found your survey to be NOT user-friendly regarding the amount of purchase.